If you’re looking for DIY gift ideas this season, you’ll find a lot of talk about saving money. The trouble is that most people seem to get it slightly wrong. They're talking about saving money for you, the do-it-yourself gift-er. Since ‘tis the season to be thinking of others, how about saving money for the recipients instead – those near and dear to you who will actually be receiving the fruits of your labor? In this spirit, check out our 7 DIY gift ideas to save your friends and family money. Personalized Toolkit. Give friends and family the gift of money-saving DIY repairs. That is, they do the repairs, with the toolkit you provide. Assemble just the right set of tools for each person on your Xmas list, customized to meet their individual needs and interests. Start with a basic home toolkit for brand new homeowners (or grownup offspring who’ve moved into their own rental digs – at last!) Then put together specialized versions – for your favorite gardener, cyclist, vintage car buff, you name it. Draft Stopper. Who’d like to slash their HVAC bills this December? Only just about everyone you know. Help cut heating costs by gifting folks with their very own draft stopper, a long filled fabric tube to block the chill from drafty doors and windows. It’s easy to knit or crochet, but if you’d like to simplify this DIY gift idea even more, cut off the sleeve of an old sweater, stuff, and then sew it closed. Decorate with button eyes and a felt tongue to turn your gift into a whimsical draft snake. Tea Sampler. Another way for your loved ones to save money on the cost of HVAC is by following the energy-efficient principle: “Heat the person, not the house.” What better way to warm up a person from the inside out than by drinking a cozy cup of hot herbal tea? Assemble a festive sampler package of various teas – using bounty harvested from your very own herb garden, perhaps? – and present it bundled together with an attractive insulated mug. Piggy Bank. The ultimate way to save money is by … well … saving money. 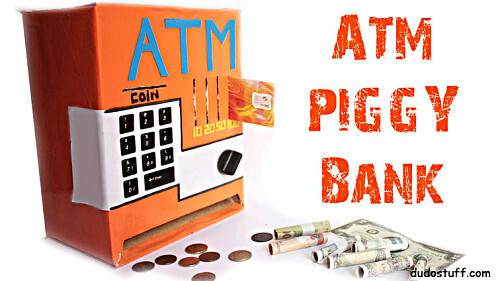 The present of a cute DIY piggy bank is a great way to encourage your favorite youngsters to save up their allowance – or adults to collect their pocket change. Go traditional with a piggy fashioned from a recycled bottle. (When I was a kid, we made banks from white bleach containers but the transparent kind, like a soda bottle, will let your recipient actually watch those coins piling up). For a fresh take on this project, craft a thoroughly modern personal ATM. Natural Cleaning Products. Speaking of bleach bottles, many of your buddies have probably switched to more environmentally safe cleaning products – or are seriously considering it. Trouble is, those eco-friendly formulas are not so friendly to the wallet. The solution? Make up a few batches yourself and share with your pals. Package in a pretty repurposed glass container or the ever-popular Mason jar. DIY Dog Treats. I love my little rescue pooch but oh! Those chew sticks and bacon biscuits can get awfully expensive, especially when you take care only to get the healthy kind. So whip up an assortment of homemade dog treats for your frugal canine-fancying friends. Present the goodies wrapped in a triangle of holiday-friendly fabric that doubles as a tres cool pet neckerchief. Incredibly Sturdy Wallet. One last necessity for the pennywise people in your life is a wallet; they do need a place to stash those dollars they've saved, after all. Hand tailor the perfect present for them – an elegant bespoke billfold that will hold their hard-earned cash, without falling apart and forcing them to buy a replacement after just a few months of use. My Air Conditioning Is Too Loud!